Our new Scalar converged tape appliance for Veeam makes it easier to create tape in a Veeam environment for offline protection against ransomware. Introducing the worlds first and only converged tape appliance for Veeam. Tape is as relevant as ever in a Veeam environment. In fact, LTO tape has emerged as a key technology in the 21st century. But it’s not necessarily about LTO tape’s low cost or ultra-secure features like AES 256-bit encryption and WORM – it’s about tape’s attribute as an “offline” or “air-gapped” storage technology to protect against ransomware and malware. The challenge is that creating tape in Veeam environments—and virtual environments in general—has required a dedicated external server that needs to be sized, installed and configured. Until now. 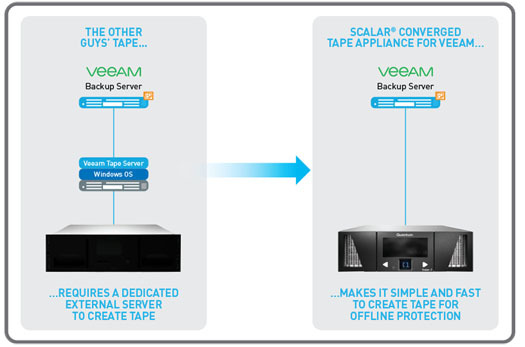 The new Scalar converged tape appliance for Veeam makes it easy to create tape in a Veeam environment. Just plug in the appliance, give it an IP address, then use the Veeam wizard to install a tape proxy server directly onto the appliance. It’s all the great benefits of tape, now in the world’s first and only converged appliance—purpose-built for Veeam.